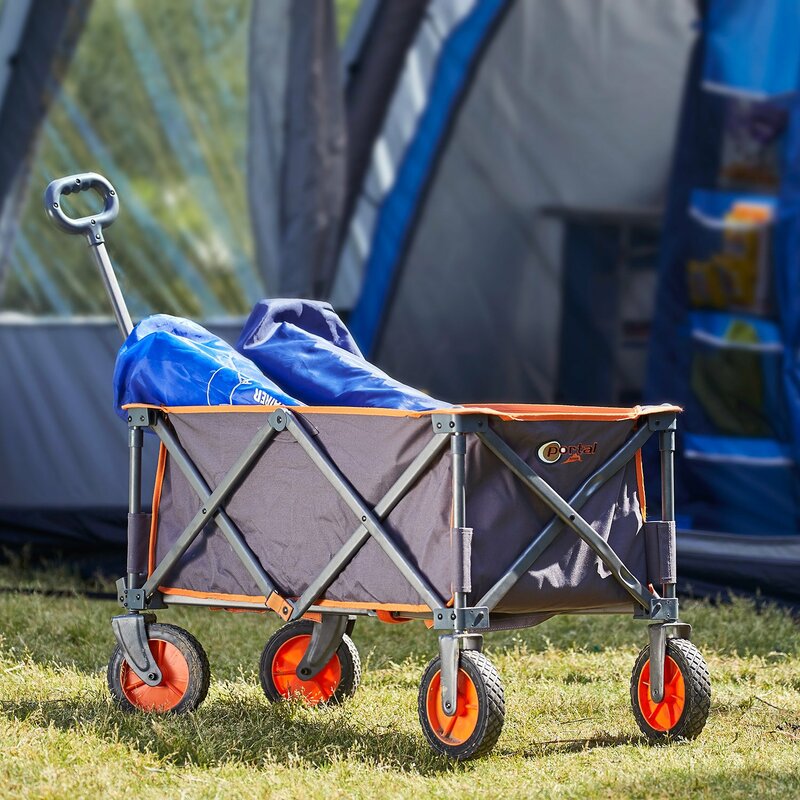 This range of highly practical and functional trolleys from Portal Outdoor are designed to help you move all of your gear around the campsite with the maximum level of ease. Choose from either our most popular Alf Trolley, or the fold-flat Country wheelbarrow for a more slimline solution. Each trolley has been designed to offer the maximum amount of space to transport your goods, and the Alf trolley is capable of bearing up to 100kg. These trolleys are also referred to as folding wagons, carts or wheelbarrows, and can be used at home, in the garden, on the campsite or even at festivals. Our wagons are designed with rugged wheels to withstand even the muddiest of fields! They are foldable and collapsible in just a few seconds and compact in size, making them easy to transport when not in use. LIGHTWEIGHT AND COMPACT - Easy to transport and built from lightweight materials. VERSATILE - Ideal to accompany you camping, on a visit to the beach, or even at festivals. UV RESISTANT - Built-in protection ensures that sunlight will not fade or damage the trolley. STRONG, TEAR-RESISTANT FABRIC - Lined with a highly durably, weather resistant material, ensuring use is possible in all weather conditions. SUITABLE FOR ALL TERRAIN - Large, solid rubber wheels allow easy transport on any surface. HIGH MAXIMUM LOAD - The Portal Alf trolley can support up to a maximum of 100kg with ease. The Portal Outdoor Alf trolley is the perfect all-round companion - whether on weekend excursions with the whole family or on holiday for beautiful afternoons on the beach and in the park. Easy to use for all ages, the trolley can support up to a 100kg payload, thanks for a sturdy tubular steel frame with fixed struts. Fully weatherproof, the trolley is easy to wash clean and folds to a particularly small form-factor for storage and transportation. The cart is walled with a tear-resistant fabric, and the wheels are made from a smooth-running solid rubber to ensure easy handling on all surfaces. The intelligent folding technology makes it easy and comfortable to take the trolley with you. In no time at all, it can be removed from the transport bag and easily set up. For this purpose, you can pull on both long sides and the trolley unfolds to its full size in a few seconds. The supplied shelf is simply folded apart and put into the stroller. Material - 100% Polyester 600D PU over a Steel Tube Frame. Easily transport your camping equipment with the highly practical Country camping trolley cart. The trolley is foldable and collapsible in just a few seconds and is compact in size, making it ideal for transporting. The versatile trolley is ideal for camping, glamping and festivals or just relaxing at the beach. The durable frame is made from robust, yet lightweight stainless-steel tubing and has a maximum loading capacity of 50kg. The compact folding trolley is easy to transport, use in the great outdoors and convenient to store away. Material - PVC Tarpaulin over Powder Coated Steel Tube Frame. © 2019, Portal Outdoor. Legal Disclaimer.